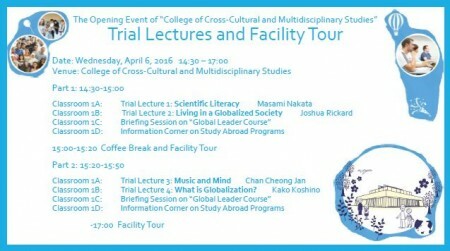 Kumamoto University will be holding an event to celebrate our new building “College of Cross-Cultural and Multidisciplinary Studies”. 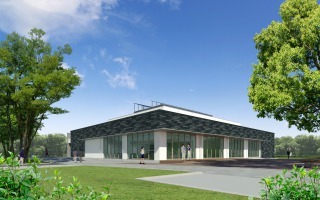 Our new building “College of Cross-Cultural and Multidisciplinary Studies”, which was developed as a symbolic facility of Kumamoto University’s globalized education, will be completed in the end of March, and start operation from the new semester, April this year. To introduce our new facility, we invite you to the opening event, as shown. You are able to experience the lectures (liberal art lectures conducted in English) given by faculty members of the College. Also, there will be the briefing session on global leader course, starting from FY2017, and the information corner on study abroad program for Kumamoto University students. Controversial science policy issues, such as nuclear power development, climate change, or genetically modified food, call for open and public debate. The need for the public to participate in the debate on such complex scientific issues implies an increasingly important role in science education in preparing scientific literate citizens. This class will explore different cultures and societies around the world and the various social relations that have developed through globalization. Through learning about different cultures and perspectives students will be exposed to different ways of viewing the world and understanding other societies. Globalization means that people in different countries have common cultural experiences by watching a Korean drama as your favorite show or drinking Frappuccino as your favorite Starbucks menu or speaking in English as a common language. In this teaching demo, we will explore how globalization impacts our lives and pros and cons of becoming one society. On March 3, 2016, Kumamoto University and the University of Brawijaya (Indonesia) signed a university-level academic and student exchange agreement. The University of Brawijaya and the Faculty of Engineering, Faculty of Science, and Graduate School of Science and Technology at Kumamoto University had already concluded a faculty-level academic exchange agreement in 2011, and it has developed into a university-level agreement to expand the exchanges between the two universities. The University of Brawijava is located in Malang, a city with a population of about 800,000 people, at 90 km inland from Surabaya City in the eastern part of Java Island, Indonesia. As one of the nation’s highly-ranked academic institutions, the University has 15 faculties including the fields of social science, science, agriculture and animal husbandry, and medicine. Through this close relationship, the Graduate School of Science and Technology at Kumamoto University has been receiving many students from the University. Rector Mohammad Bisri and six other members from the University attended a signing ceremony. Rector Bisri and President Shinji Harada at Kumamoto University signed the agreement and exchanged a firm handshake. During the visit, Rector and his team visited the Graduate School of Science and Technology, took a site tour and exchanged opinions regarding the possibilities of student exchanges and joint researches including double degree programs. We hope that our agreement will encourage exchanges throughout the university and develop into interactions in new areas. 41 high school students came from 6 different schools to join the 39 international students who attended the Spring Program. The international students’ home countries included Nepal, Indonesia, China, Taiwan, Korea, Vietnam, and Thailand. 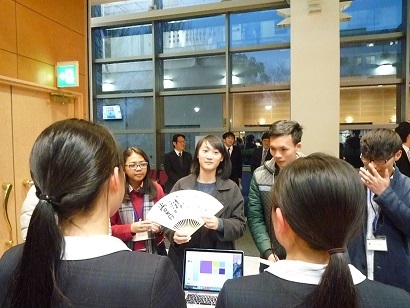 During the event, the international students first made simple self-introductions in Japanese, and then made presentations in English about their experiences with Japanese culture (namely kendo and calligraphy) and the places they visited during the Spring Program, including Yamaga, Kumamoto Castle, and Reigando. Finally, the participating students enjoyed free talking time in English. Many participating high school students reported that they “were able to have a great experience” and “enjoyed the chance to speak with foreign students”. Kumamoto University’s Global Youth Campus project will continue to seek to provide more opportunities for the youth of Kumamoto Prefecture to experience global education and interaction with international students in the future.